“My family has lost everything”. That’s how Jean Richard summarizes his story. Born in Montreuil-Bellay in 1941, he only remembers the movie projector and the movies that his father, who was the owner of a wandering cinema, was able to rescue from the war. In addition, a photo remained to him. One can see his aunt Rose Richard, his father’s sister who married Louis Winterstein in 1935. Rose and her husband owned a travelling circus. They too have lost everything. 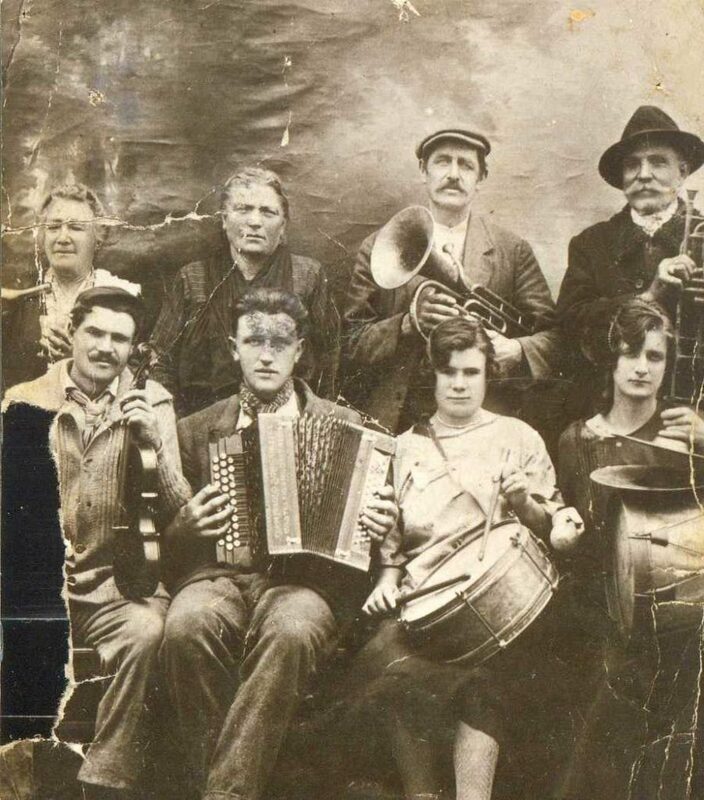 Jean Richard’s family: In the top, from left to right: Aunt Rose Winterstein, born Richard; grandmother Ferchal Rosalie Richard; uncle Louis Winterstein, husband of Rose; grandfather Jacob Richard; father Gustave Richard with violin; cousin George Winterstein, Rose’s son; Aunt Batistine Richard; Cousin Marie Winterstein, Rose’s daughter. Rose was born in Ste Colombe sur l ‘Hers (Aude) in 1899 and husband Louis in Saint-Cyprien (Pyrénées-Orientales) in the same year. The couple had a total of 11 children. Three of them were from Louis’ first marriage. The youngest son Charles was born in Lugon, October 19, 1940. At this time, the family was already under house arrest. Nothing was denied by a decree of the French Ministry of the Interior of April 6, 1939, the travel. On October 25, 1940, the German occupation authorities demanded the reunification and internment of all non-indigent persons. With the help of French Gendarmie the family was taken into custody and brought through an interim storage at Merignac in early December 1940 in the camp Poitiers. The camp conditions were harsh, but the family could stay together in Poitiers until January 13, 1943. On that day, 70 men aged between 17 and 60 years were taken to the Internment camp of Compiègne. From there they were deported to different concentration camps in Germany. Among the deportees were also father Louis and the family’s eldest sons Georges and Jean. Rose remained in Poitiers with the rest of the children. In June 1943, Florès Campos offered her a permanent accommodation outside the camp. He became aware of Rose because his son Pierre together with her wife Jeanne Scherrer, a circus acrobat, were also interned in the Poitiers camp. In June 1943, Campos issued Rose a certificate of accommodation. In July 1943, Rose asked the camp administration for their release with reference to this letter. However, the petition was rejected. Rose and her remaining children did not leave the camp until July 27, 1945. Her husband and sons Jean and Georges, who were deported to Sachsenhausen, Buchenwald and Flöha after their departure from Poitiers, survived the concentration camps and returned to France after the war. Sources: Archives départementales de la Vienne: 109 W 353; 109 W 313 Internés. Contrôle des effectifs, décembre 1940 à février 1944, registre de contrôle nominatif. Nomades; Archives départementales de la Gironde: 58 W 82 Nomades et Forains. Instructions 1940-1967; 58 W 84 Recensement des nomades 1940; 71 W Vrac 670 Rapport de Merville, Chef de Division sur la dissolution du Camp des Nomades; 104 W 3 Correspondance du 2 mars 1943 entre le chef de camp et le préfet de la Vienne. Liste des nomades partis travailler en Allemagne en date du 13 janvier 1943; Filhol, Emmanuel: L’internement et la déportation de Tsiganes français, Mérignac-Poitiers-Sachsenhausen, 1940-1945, Revue d’histoire de la Shoah. Le monde juif, n° 170, septembre-décembre 2000, p. 136-182; Filhol, Emmanuel: Le traitement administratif des Tsiganes dans les Landes (1895-1946) Annales du Midi, 2010, p. 407-429; Gaida, Peter: Le camp d’internement de Mérignac, http://www.petergaida.de/texte/M%E9rignac.pdf; Hubert, Marie-Christine, 1940-1946, l’internement des Tsiganes en France, Hommes et; Lévy, Paul: Un camp de concentration français: Poitiers 1939-1945, Paris 1995; Lévy, Paul: Les Tsiganes de Poitiers: du stationnement à l’internement (décembre 1940-mai 1941), Etudes tsiganes, 1996, n° 1, p.47-52.